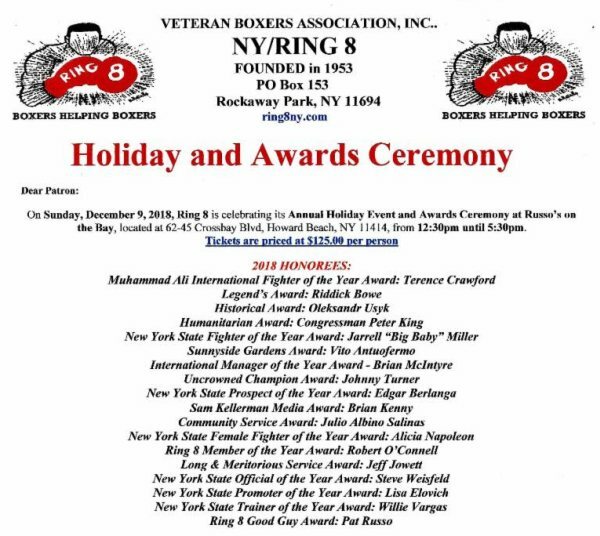 New York (December 5th, 2018) - Some of the biggest names in boxing will be on display as Ring 8 will host their annual Holiday and Awards Ceremony at Russo's on the Bay (162-45 Cross Bay Blvd, Howard Beach, NY 11414) beginning at 12:30 p.m. and lasting to 5:30 p.m. Highly ranked heavyweight contender, Jarrell "Big Baby" Miller will be honored with the New York State Fighter of the Year. "Every year the Ring8 holiday and awards banquet attracts substantial star power, but this year it has gone to an even higher level. That is why interest in the event is greater than it has ever been" says Ring8 president Jack Hirsch. "In Terence Crawford and Oleksandr Usyk, we have arguably the two best pound for pound boxers in the world confirmed to attend. Joining them will be former heavyweight champion Riddick Bowe and current heavyweight contender Jarrell Miller who will also be honored. The room will also be filled with a number of former world champions like Iran Barkley, Junior Jones, and Luis Collazo. There is also a possibility that Vasiliy Lomachenko will attend to see his good friend Usyk being honored." "The food and atmosphere at Russo's on the Bay is second to none. That along with the many boxing luminaries will make it an afternoon to remember."